Here is a "tooth" recipe for dental health month or any time of year during a health unit. Use apples and sugar smacks type cereal for teeth that are not healthy. I halved the apples and then quartered them and then slit the quarters in two to form two lips. Each child got two lips and about 10 sugar smacks. They opened the lips and put the the smacks inside to form "rotten" teeth. 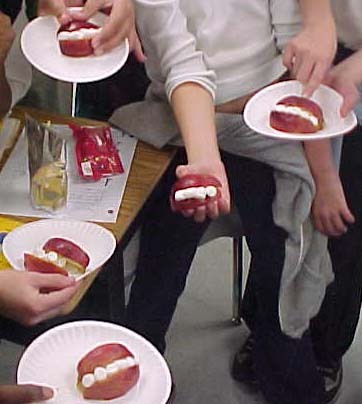 They did the same thing with 2 more "apple lips" and mini marshmallows to form "healthy teeth".